It has been one year since Allan Preston Brooks joined our team. Allan has coordinated our food distribution and has been instrumental in new sources of food for people who need extra help. Thank you Allan for a job well done! 2018 A Great Year Thanks to YOU! This year has been an incredible year for www.TheProjectNashville.com. Our small troop of men and women have worked week in and week out to help make life better for some in our community. We started the year off with an addition to our service team. Mr. Allan Preston Brooks joined our staff and is doing an incredible job coordinating our food distribution. Thanks to Evangelist George Medley for making this possible. Allan’s quest to serve is unmatchable and his willingness to give back is unstoppable. What’s more Allan is the author of a new book - his latest “Ransomed” which tells his incredible life story. TPN will send you a copy of “Ransomed” for ANY financial gift you send to support TPN. and donate through our Paypal link. “Ransomed” is a page turner and you will defiantly be inspired. Eat Well Nashville has supplied weekly donations of food allowing us to feed thousands of meals to homeless camps, halfway houses and churches. I’m amazed at the scores of people from New York to California and many places in between who are helping our team make life better for some in this part of the country. Thank you for your generosity and extending a had up. Looking forward to 2019 - we will continue to go into prisons meeting men and women where the are in life. We just made a deal with a Mobil shower Winnebago that we will be taking to camps. This gift will allow folks to shower and wash clothes a well needed service. What’s more our team is stepping up our food distribution with new non perishable food items that we will be delivering weekly along with our meals to homeless camps. But encourages us to look after them. Our goal is to use our services as a tool to gain trust, build relationships, give an exit strategy when they are receptive to it - all with the end goal of showing the the love that God has for everyone. Sometimes it is that love they discover that turned the lightbulb on in their mind and ignites a new sense of self-worth in purpose. And we have seen firsthand when that when that happens - incredibly positive things start to happen in peoples lives. Thank you all again for supporting The Project Nashville - we truly are grateful! Have a great Thanksgiving and make it a habit to help someone every day. Many people just don’t think about it. Some people worry about it. Other people have prepared for it. There was a time when I didn’t know. I lost sleep over it. I know some people today find it hard to know. frantically motioning me to come into the building. “Karen has passed out and was on the floor,” she told me. I hope she knew that her soul was safe in our creator’s hands. I realized that I want everyone to know what they are missing by not having the God of creation in their life. I want all to know that about two thousand years ago - God put on earth clothes and came in the form of the person of Jesus. He went around doing good. Jesus loved people, fed the hungry, cried with the widows and healed the sick. All those acts under the scrutiny of the religious leaders of the day. He was a maverick and didn’t care what people thought. Jesus didn’t always do what was right under the law, but he always did what was good. So, do you think about it? Be the maverick in your world. Step out of your comfort zone and follow the example of Jesus. Death will knock on all of our doors someday. So live your life doing good, follow Jesus and give your soul to Him and in the end, you will be prepared to meet the next level of our existence. Please settle this in your heart today. We will miss you Karen. NASHVILLE, Tenn. — J.R Davis never knows what the day will bring. 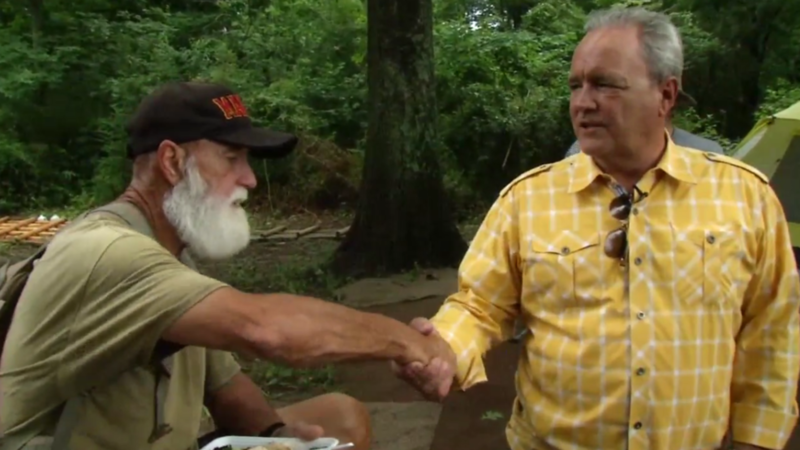 The Project Nashville checks on homeless camps. Sometimes people need to go the hospital. Sometimes they just need food or water. Mostly they just enjoy feeling cared for, which explains in many ways why there is a beautiful tiny home sitting at Brook Hollow Baptist Church parking lot for a year. To make a long story short, there was a proposed tiny house community. Davis raised the money, got a church youth group, and built this house. Then the deal to buy the property for the tiny house community fell through and this became the house without a home. "So my challenge today is two fold," Davis said. "I need this to help the homeless, and we need a house. This place has homeless DNA. I also need a mover through the a generous heart to come and move this to a final resting place." Alot of people have stopped and made offers as high as $10,000, but they want a hunting lodge or a playhouse. Davis said no way. “We are willing to give it away, but it has got to go to the homeless," Davis said. "Let’s move it faster than you can say bob’s your uncle." Who knows, maybe someone from the woods could one day call this home. “The second someone says 'I have had enough get me out of here', we get them out of here,” Davis said. If you have a great home for the tiny house, contact Davis at The Project Nashville. I have had breakfast, lunch and dinner with many awesome men who are walking in the path of Jesus. These men of God are men you all would want to have on your short list of people to share a meal with. Personally I am constantly wanting to surround myself with wiser kinder people then myself. Perhaps it is my struggle with depression - or the real J.R. who has to force himself to be outgoing. No it does not come naturally for me, I have to work every day on being a good person. Don't get me wrong, at 61, I have a pretty good handle on this struggle, but I love finding out how other men of God are dealing with life. One such man is Father Charles Strobel. ... and I had breakfast with him this past week. Years ago when I was introduced to this man, my business partner H David Smith, Charlie embraced me and took me into his circle of friends. Lets stop here for a second... and let you in on a few lessons I have learned from this man. LESSON 1 - Ask yourself "Am I embracing people and letting them into my circle?" Just a question I have to constantly ask myself. Back in the early 90's I was asked to help the The Room in the Inn Board with marketing material to help rase money for the new building. It was a clean white color project. I say that because as I entered the compound, i would quickly walk though the hundreds of homeless people hanging at the doors, avoiding eye contact, avoiding pan handlers and quickly enter the office with a sign of relief. Through this process I got to know Father Strobel. "if you don't understand who this Jesus fellow is - just follow me for a week and you will get it". Wow! That I could ever be so bold. But if you want to see who the man we call Jesus was all about - spend just a day with Father Strobel. It was this man that showed me how to have a heart for people with struggles. LESSION 2 - Strive to walk this life like Jesus did. At this breakfast we talked about so much. One thing stood out, this man struggled with life just like the rest of us. Isn't it great to know that you are not alone? LESSION 3 - Open up to others and let them peek behind the smiley face you have. Your honesty of your struggles may encourage another person to persevere. Finally we started talking about the legalism that some faiths impose on their followers. He gave me some great insight on the subject. The Good Samaritan story is one that we are all so familiar with. You remember the story, a man was in a ditch - beaten and perhaps near death. People passing by ignored him, some moving to the other side of the street . We focus on the people who passed with out helping with indignation. How could they not stop? A good man - the good guy stops and helps the man - taking him to a place that would help him heal and paying for his care. Father Strobel pointed out that there was much more to the story than bad people passing him by and a good man helping. So in a way - the people passing by were obeying the law. Now here is the Kicker..
My friend sitting across from me as we ate our eggs and drank our coffee said to me. "There is doing what is right... and then there is doing what is good." In the oppressive law of the day - you don't touch the unclean. But what was right as a human was to help this beaten man. LESSON 4 - Ask yourself - Who are we walking past? How can we walk past those in need? We must extend our hand to those in need - without hesitation - without question - without judgment. Lord help me JR Davis to not walk past anyone in need. I hope you pray that prayer yourself. Thank you Father Strobel for your friendship, mentoring over the years and example you show us all every day. He had been laying in the dirt for hours - His camp mates, a man and woman told us that they had tried to wake him but he just lay there in the heat. We checked to see if he was alive and he was - but for sure he was in danger. We shook him until he started responding. Finally he got up and started drinking the sports drink we offered. He was on the edge of getting irritated with us but calmed as he ingested more drink. The temp was in the 90s and he was sure to be dehydrated. So we stayed around until he could talk and make some kind of sense. We found Chad passed out at a neighbors camp... he was passed out with a hatched by his side. Earlier we visited his camp on the hill and left him some food and drink. He roused and told us that he was just trying to get away from the noise... He was in a friends peaceful camp looking over the Cumberland river. 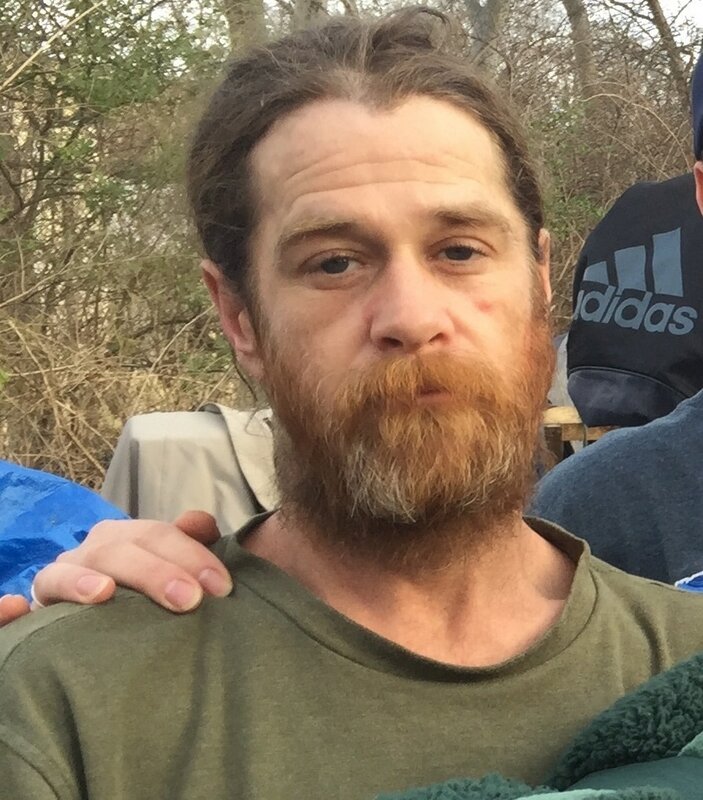 For the last year we have tried over and over to get Chad and his brother off the streets but meth continues to beat us to the doors of their tent every week. So we continue to offer hope to the hopeless, food for the hungry and help for those who will take our help. We need more volunteers to prepare plates of food. 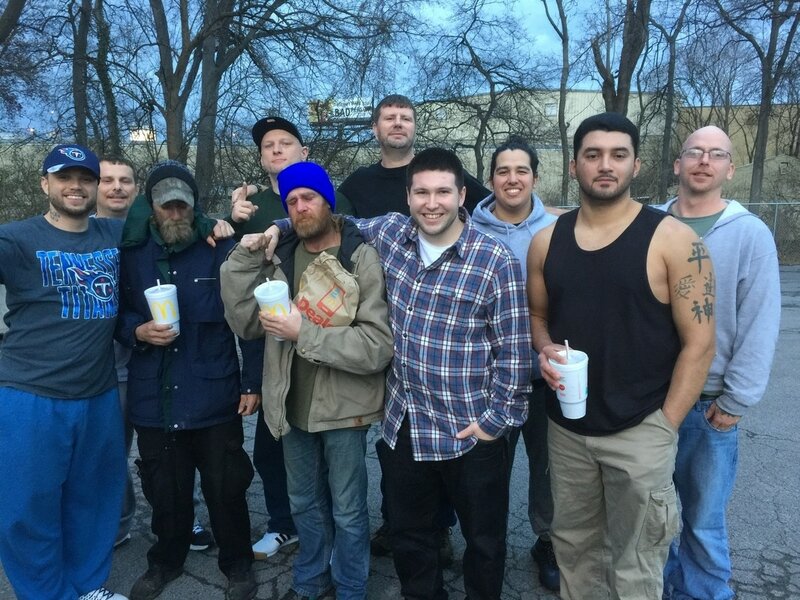 The day was Wednesday and my team of Men of Valor Men and I were going out to see if we could bring hope to some of the folks on the streets of Nashville - just like we do every Wed. But Today I had "this feeling". I didn't want to go to the same ole places - A camp in the south of town - a camp in the west of town - the park in down town... The feeling was steering me away from those easy targets for us. When the men were loading up in the van they all asked "JR where are w e going today?". I simply answered "I don't know" and I didn't know. 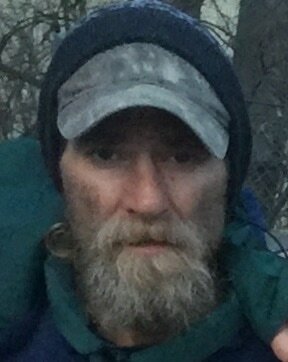 Earlier I had driven by a group of homeless men sitting near their south of town camp , so I swung the van by their hang out - handed out some Mac D's and a couple sleeping bags - but that only took 20 minutes. We still had an afternoon to work the streets. I started driving down town and the questions still persisted - "Where are we going"? We drove in silence for a few miles. My mind spinning trying to think of a different place to go today. Why - why or what was weighing on my soul. Earlier that week I had helped a new couple on the streets get back to their camp. So the thought hit me to take them to dinner with us. Settled on that plan o f action I turned the van towards their camp. The camp is a dump site inhabited by a few tents in the middle of the piles of trash dumped over the years. We parked and headed into the woods at the dump. One man was outside his tent. The man told me that they had moved out that same morning. OK then why were we here? - I thought. The uneasy feeling that I had had subsided once the decision was made to take the couple to dinner but now they were gone... so I focused my attention on the man in front of me. "What's your story?" I asked. He told me that he and his brother moved to the camp when their mother died in July. They lost the house - got into Meth - and had been on the streets ever since. 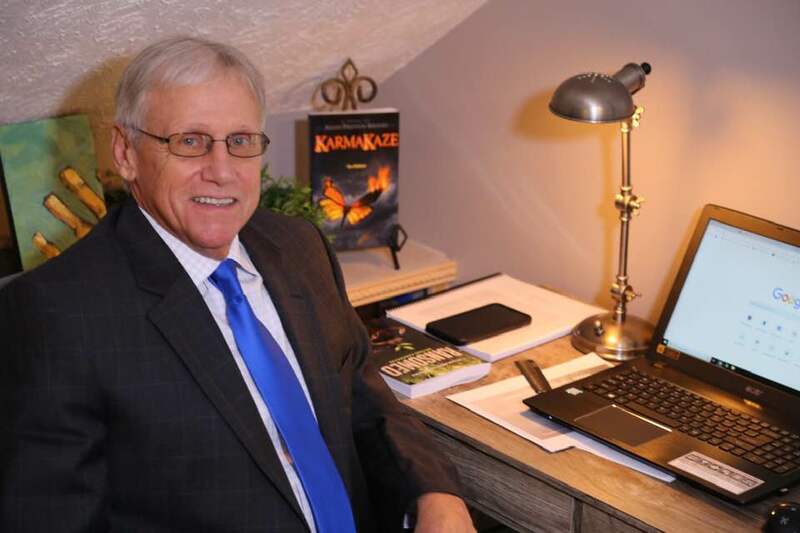 I listened to his story and when he finished I asked the question my spiritual mentor Bill Howard taught me to ask - "So how does God fit into your story?" That's it - that is all you have to ask - it is a beautiful door that opens to expose the face of Jesus. The man named Chad, started crying. He told me that he and his brother were praying the night before that somehow they would be able to get off the streets and off drugs. I told him that I could help him. He hugged me and continued in his tears to tell me that we were an answer to prayer. I asked if he was hungry - and I knew the answer - he was. We invited him to go eat with us. His brother was out pan handling so I suggested we get him a meal also. Chad whet to dinner with us and refused to eat his food as he wanted to eat with his brother Jeramy so he could discuss the options I had suggested to him with his brother. Back at his camp Jeramy was waiting for him anxious no knowing where his brother had gone. Chad told his brother that we could help them and asked that we come back the next day. The next day I stopped by the camp to pick them up - but they were nowhere to be found. I stopped in a couple more times but they were not at the camp. A week later I saw Jeramy and he told me that they had contacted a relative in Texas who was coming to pick them up and take them to be with their family. Jeramy with clear eyes thanked us for the hope were were able to offer them and assured us that they were going to be OK. There was no real effort we extended these brothers. Didn't do much at all. I firmly believe that a force greater the me - kept me uneasy all day to direct me directly to Chad and Jeramy with one purpose. ​I believe that force was the Creator of the Universe God Himself who led us down that road - behind a vacant warehouse in a dump next to the rail road tracks to meet Jeramy and Chad. What's more - I believe that they both needed someone to tell them that there was hope and that the God they prayed to was real and in the business of answering prayer. We were able to do just that. Sometimes that is all we need to do. Offer HOPE to someone to day - it may change their life. I had met with him once before and was totally intrigued by his positive attitude. The last time we met we had a common connection to Memphis Tennessee. Kathy, my bride was from Memphis and he grew up in that town. So a year had passed and he remembered our first visit. Vincent still had that great smile and incredible gratitude towards God for all the blessing He had given him over the past year. He asked me about my oldest son Johnathan who was with me the first time we had met. I told him that he was coming... but later found out that he was turned away at the gate... Something that happens upon the whim of staff. I told him that his picture was in my office. He smiled even bigger and said it was nice to know that there were some who cared. Vincent told me that he was always trying to stay busy. I could not imagine what that "busy" actually looked like. From what I could see through the Pie Hole - he had a cot size bed - a book shelf - a shelf with some food items, mostly junk food. Oh yes there was a toilet and sink. We talked about surface stuff - but mostly hope and God and gratitude. Before I knew it our time was up. I didn't want to leave - I wanted more time with Vincent. I wanted to talk and encourage and love on him. I was the last in the pod except for my good friend The Rev. - Chaplain over the prison. I told him that I loved him and he told me that he loved me too - we shook hands and I left Death Row. I had a lump in my throat and still do when I think of him. I learned three things from Vincent that day. 1 - No matter what your circumstances there is always Hope. 2- Nothing - I mean Nothing - should stop you from having a positive attitude. 3 - God is always there for you and offers peace that we simply can't understand. I ask that you hold your friends and family tight this Thanksgiving. Activists for homeless - inmates and the poor of this world.